instead praise the pulsing, cells traveling along a heart-knock system, reminders to spend time counting brown spots & stretches of folded skin winding deep like dirt country roads. We look for ways to make magic, brand the land, prove we were here. But the body is the mark: a flesh-mound harvest, gleaned from kicked-up dust after one wild long run. carved on, day after day. This is a praise poem for the body, a response to American ideas that we should 1) leave a mark upon our cities/countries by the time we die and 2) mourn aging. We act as though living in itself is not an imprint. How we impact others spiritually, is our legacy. The body is the mark that we were here. And dealing with daily crises, including watching our bodies deteriorate, should be acknowledged as feat: this wrinkle, mole, age spot, means today I am, and today I resisted & persisted. This black, this brown body, means today I resisted & persisted. There is prayer in the exaltation of a body’s breakdown. It means it’s going through a cycle that’s the human continuum—life that will either go back to the earth and provide nutritional sustenance for other life; or burned and released to the atmosphere. It is a wondrous human connection. As bodies of color we must remember that walking through this America every day and maintaining our sense of self, despite when we’re told we’re not [insert anything here] enough, is an act of resistance. For this, we praise the waking flesh. 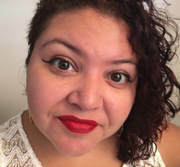 New Jersey native Ysabel Y. Gonzalez received her BA from Rutgers University, an MFA in Poetry from Drew University and works for the Poetry Program at the Geraldine R. Dodge Foundation. Ysabel has received invitations to attend VONA, Tin House, Ashbery Home School and BOAAT Press workshops. She is a CantoMundo Fellow, and has been published or is forthcoming in Tinderbox Journal; Vinyl; It was Written: Poetry Inspired by Hip-Hop; Wide Shore, Waxwing Literary Journal, and others. You can read more about this Wonder Woman aficionado, and her work, at www.ysabelgonzalez.com.